The Ministry of Interior and the Prosecutor's Office keep silent; Bivol has operational information on a corrupt scheme aiming at a more lenient measure of remand. The wanted by Interpol Bulgarian citizen Martin “Dzhito” Georgiev has quietly returned to Bulgaria this week and is in custody. On Monday, the Special Court for Serious Organized Crime and Corruption will rule on his detention. This was confirmed for Bivol by the Press Office of the Specialized Prosecutor’s Office. 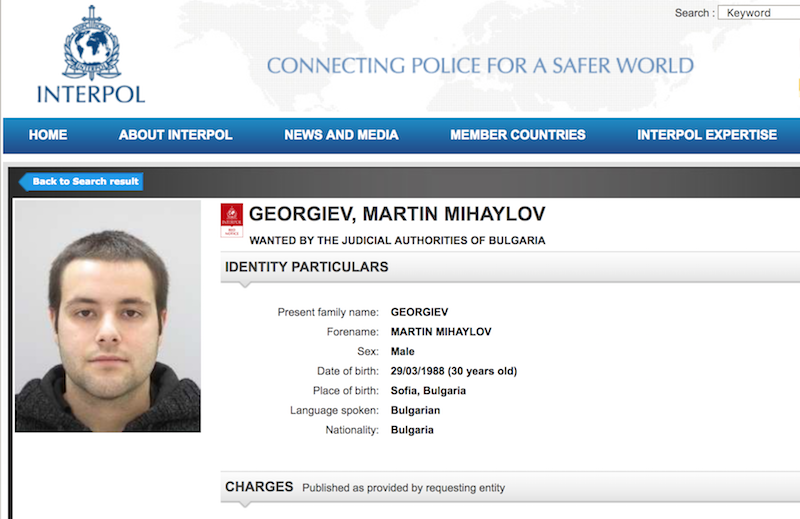 Georgiev is the son of Mila Georgieva, step-daughter of former Customs Chief Hristo Kulishev. “Dzhito” is one of the main protagonists in the organized crime group “The Killers 6”, along with his mother and several other individuals accused of serious crimes – murders, arson and racketeering. The Interpol notice says he is wanted as the leader of an organized crime group. Besides wet jobs executed by “The Killers”, Mila Georgieva has been investigated for VAT draining through the group “The Universals”, along with Ivan Tanev, son of former Bulgarian Agriculture Minister Georgi Tanev. There is another investigation against her over the theft of nearly EUR 26 million in European funds earmarked for food for the poor from Romania’s equivalent of the Bulgarian Fund Agriculture (the agency distributing the funds). The case, which found its place in the EU’s anti-fraud office (OLAF) last year report, was thoroughly investigated by Bivol in a series of publications. It was proven on the base of documented evidence that part of the stolen European money had been laundered through offshores and had returned to Bulgaria through a company in which Martin Georgiev is a co-owner. Sources from Brussels tell Bivol that the investigation in Bulgaria against Mila Georgieva and her people over the biggest single theft of European funds has practically reached a dead end. The explanation is that the scheme includes Tseko Minev and Ivaylo Mutafchiev, majority shareholders in First Investment Bank (FIB or Fibank) who enjoy a government cover-up. The wanted Bulgarian citizen has returned on his own will and has not been detained and extradited. There is no public information whatsoever on the case from the Ministry of Interior and the Prosecutor’s Office which, unlike in other similar cases, have not boasted of this “big catch”. We recall that the investigating authorities were similarly silent after a large amphetamine seizure from another member of “The Killers” gang – Oleg Popov. He was eventually released from custody. Popov turned out to be a partner with the infamous Ginka Varbakova (manager of the company Inercom Group, which was chosen by the electric power utility CEZ to buy its business in Bulgaria – editor’s note), according to Bulgarian Capital daily. The partnership dates back to the time when Ginka’s husband Slavcho has been a partner with former model and Miss Bulgaria, Evgenia Kalkandjieva. Bivol has obtained operational information from a source familiar with the prosecution file on Georgiev’s case. For now, we have uncorroborated information that a corruption scheme has been set in motion by authorities, aiming at changing the defendant’s measure of remand to a lighter one. According to the report, an agreement and payment of specific amounts to certain persons against specific commitments in favor of Georgiev have been intercepted. As our operational information cannot be corroborated by more than one source at the moment, we will not publish it yet. However, if it is confirmed, we will make it available to the public and the relevant institutions, including international ones.